One of the biggest challenges wind farms face is how to generate power when there’s no wind. Max Bögl Wind AG and GE Renewable Energy are attempting to solve that issue by combining wind turbines with hydropower technology. The wind-hydro plant will be the first of its kind, and it’s set to be fully operational by 2018. The innovative renewable energy plant is designed to generate power even when wind isn’t blowing. It will feature the tallest wind turbines in the world, according to GE Reports, which stand 584 feet tall. The turbine bases serve as reservoirs containing 1.6 million gallons of water, and the wind farm will be surrounded by an additional reservoir containing 9 million gallons of water. To function, the wind-hydro plant must be located on a hill. Water will flow down the hill to generate hydro electricity, and it will be pumped back up the hill when energy is not needed. This enables the wind-hydro plant to continually produce power. GE Renewable Energy and Max Bögl Wind AG found an ideal location in Germany‘s Swabian-Franconian Forest. The wind farm will generate 13.6 megawatts of energy, and the hydroelectric plant can generate 16 megawatts. A pilot project with four wind turbines is slated to connect to the grid in 2017, and the hydropower plant will be operational in 2018. The project will help Germany achieve its goal of generating a minimum of 45 percent of its energy via renewable sources by 2030. GE Renewable Energy is collaborating with Max Bögl Wind AG on a combination wind power and hydropower plant. The wind-hydro plant overcomes some of the challenges faced by wind turbines on their own. 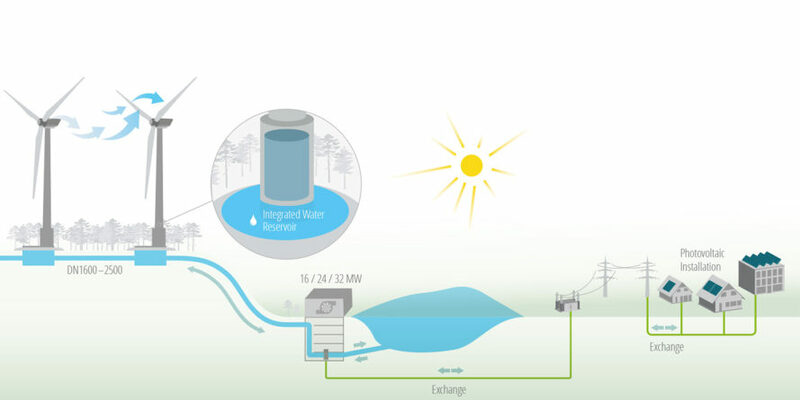 The water in the wind-hydro plant will act as a battery so the plant can keep supplying energy when the weather is not windy.